George E. Dunham is the namesake of Whitesboro’s Dunham Public Library. He was born in Clayville, NY. The only child of Reverend Doctor Moses Earl and Harriet (Hughston) Dunham, he would grow up in the Dunham family home on Main Street in Whitesboro, NY. Thanks to a life spent in public service, he would become a major leader of the Greater Utica area at the turn of the twentieth century. He was one of the best known, civic-minded and most prominent citizens of the area. He attended private schools and graduated from Whitestown Seminary in 1875, the youngest member in his class of thirty-five students. The Whitestown Seminary was the first institution of higher learning in the country to admit African American students. At the Seminary, he excelled in classical scholarship, public speaking and became a very good orator. Due to his great skills as a speaker and orator, he was often called upon to preside at banquets and public events. He received a Bachelor of Arts degree from Hamilton College in 1879, where he was again the youngest in his class. The same institution would later confer upon him an honorary Doctor of Laws degree in 1921. George Dunham returned to Oneida County in 1881 and became vice-principal of the Whitestown Seminary, where his father was principal. He would serve under his father for fifteen months, teaching Latin, English and Public Speaking. In 1880, he was admitted to the Oneida bar, joined a law firm, becoming a junior member of the firm of Baylies & Dunham. The partnership was dissolved upon the death of Waite but he continued the office for literary work of a legal nature and for some general practice. He worked as a law clerk for two years in the office of Edwin Baylies of Johnstown, NY, where his father had been a pastor for two years. While in Johnstown, George worked to become a lawyer. He studied under and aided in the preparation of law books written by local lawyers William Waite and Edwin Baylies. He enrolled in a lecture course at Hamilton College, eventually taking and passing his examinations to be admitted to the New York State Bar Association. He also worked as a reporter on the local paper. It was in Johnstown where he began his lifelong profession: Journalism. He became a junior reporter for the Fulton County Intelligencer. He did such a commendable job that after a few years, he became the editor of another newspaper, The Johnstown Republican. He was paid three dollars a week and worked for The Republican for two years. After The Republican, he accepted a position as a reporter for the Utica Daily Press in 1882, which was then a mere three months old. He advanced through the ranks from junior to senior reporter. By July 1883, he began working as an editor and would work his way up the ranks. In 1886, he was named editor-in-chief and president of the Utica Daily Press Publishing Company and continued in the role until his death. T.K. Proctor was elected vice-president of the paper in that same election. He made the Utica Daily Press a financial success and a power for good in the community. His influence was also felt as an educator, writer, public speaker and business man. On January 9, 1884, George Dunham married Helen L. Jones of Utica. They had one daughter, who died in infancy in 1888. In addition to their home on Main Street in Whitesboro, they also had a home on Hart’s Hill, known as the Hughston Farm, where they spent summers. He also had his own fishing preserve in Remsen. In 1913, he took a three-month tour of Europe. In 1887, he was appointed manager of the Utica State Hospital for the Insane by Governor Hill, was reappointed by Governor Flower and again three years later by Governor Morton. In 1900, while working as Editor of the Utica Daily Press, George Dunham helped urge Utica voters to build their new library via tax revenues. Utica voters acted on behalf of the library and approved a $165,000 bond issue (equivalent to an estimated $4,425,000 today). This was a considerable expenditure by any standards for a city with a population of 56,000. In 1905, he was made chairman of the board. Under reappointment from several governors, he continued on the board for thirty-five years. In recognition of his long service, one of the buildings is now called Dunham Hall. While living in Utica and editing the newspaper, Mr. Dunham was also involved in founding the Utica Trust and Deposit Company, a financial institution, where he served as a member of its first board of directors. He was appointed by Mayor Kinney to be chairman of the Utica Electric Light Commission and served three years. He was director of the Utica National Bank and of the Utica Mutual Insurance Company and president of the Partlow Corporation. He was instrumental in the establishment of the Utica Chamber of Commerce and became its first president in 1898. He was the President of the Board of Trustees of the Young Men’s Christian Association (YMCA). He entered into the work of naturalization heart and soul as a patriotic duty and accomplished much. He taught naturalization classes for immigrants and received national recognition for writing a complete textbook on the subject. What Every Citizen Should Know was published in 1922. 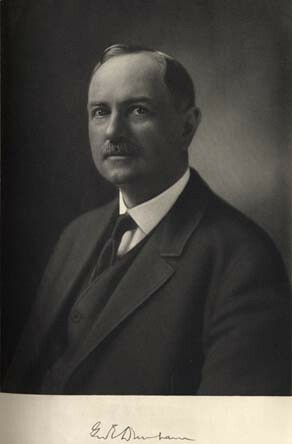 In February 1920, the University of New York Board of Regents expressed its appreciation of his citizenship work. In October 1920, the Postmaster General named the Devereux Street Post Office, Dunham Station, in recognition of his naturalization work. He was elected a trustee of Hamilton College in 1891 and re-elected in 1895. He was also involved in many of the area social clubs: Fraternally, he was identified with Oriental Lodge of the Free and Accepted Masons, the Benevolent and Protective Order of Elks, Fort Schuyler Club, Arcanum, Rotary, Sadaquada Golf Club, Yahnundasis Golf Club and the University Club of New York. He also belonged to Pi Epsilon, a Greek letter society of Hamilton College. George Earl Dunham died, on October 29, 1922 at age 63. Flags flew at half-mast on City Hall, the County Building and the Fort Schuyler Club. Upon his death, Hamilton College resolved to erect a permanent memorial to Mr. Dunham on campus. The Oneida County Bar Association officially recognized him as an outstanding member. The George E. Dunham Club, an organization of naturalized citizens, passed a resolution of sympathy as did many other organizations, such as the Board of Governors of the Rotary Club. A monument is dedicated to George E. Dunham for his philanthropic accomplishments. The monument is located on Memorial Parkway at the intersection of Holland Avenue in the city of Utica.